AUBURN — Normand R. Jambard, 93, of Lewiston, died peacefully Saturday, Jan. 6, at the Hospice House of Androscoggin. He was born in Van Buren on July 4, 1924, the son of the late William and Emma (Roy) Jambard. 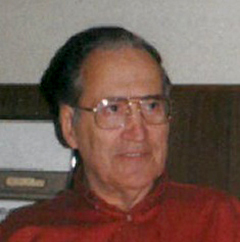 Normand was raised in Van Buren and moved to Lewiston in 1945. He married the love of his life, Laurette Beauchesne, on June 28, 1947. Normand attended CMVTI where he received his degree as a master electrician. He worked at Bates Fabric Mill as a master electrician until his retirement in July 1989. Normand had a passion for music and loved to play the violin and harmonica, often playing at the former L-A Montagnard Snowshoe Club of Lewiston. Normand received the Honors of the Fourth Degree of the Knights of Columbus on June 1, 1980, and also was a member of the Holy Name of Jesus at Saints Peter & Paul. He is survived by his sisters, Jeanne St. Pierre, and her husband, Fred, of Caswell, and Annette St. Jean, and her husband, Sylvio, of Connecticut; his brothers, Leo Jambard, and his wife, Merilda, of Florida, Elbridge Jambard, of Connecticut, Gilman Jambard, of Florida, and Nelson Jambard, and his wife, Dolores, of Florida. He was predeceased by his wife, Laurette Jambard, who died Feb. 6, 2004; a son, Roger, who died as a young child; his brothers, Clarence, Clifford and Gilbert Jambard; and a sister, Germaine Daigle. The family wishes to thank the nurses and staff at Montello Heights and Montello Manor for the wonderful care Normand received. We would also like to extend special thanks to the Hospice House of Androscoggin.